The steps to which the girl had pointed were those which, on the Surrey bank, and on the same side of the bridge as Saint Saviour’s Church, form a landing-stairs from the river”. In Charles Dickens’ 1830s novel, Oliver Twist, Nancy – the original tart with a heart – arranges to meet Mr Brownlow and Rose Maylie on London Bridge. She guides them down a set of squalid stairs out of sight, where she gives details about Monks, Oliver’s evil half-brother, so that he may be apprehended by the forces of justice, thus protecting Oliver. The meeting is overheard by Noah Claypole, who had been dispatched by dastardly crime-boss Fagin to follow Nancy. Noah duly reports back to Fagin, who gets Noah to repeat the story to Nancy’s lover, Bill Sikes, including the amusing detail that Nancy had drugged Bill with laudanum so that she could meet Rose on a previous occasion. 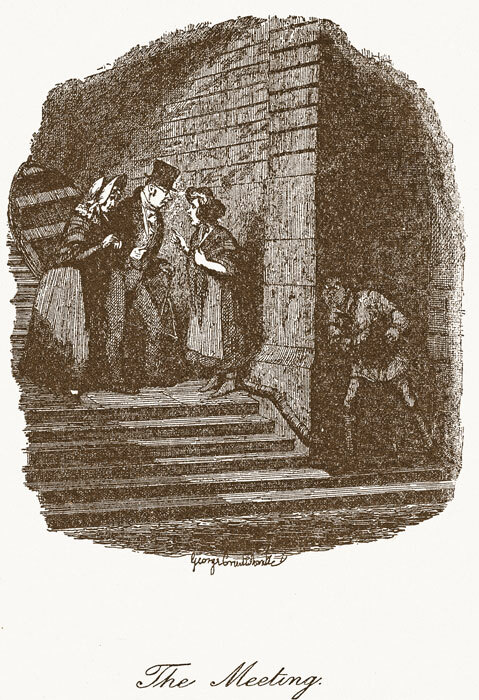 Sikes, despite being asked by the scheming Fagin to not “be – too – violent”, beats Nancy in the head with a pistol then finishes her off with a heavy club in the lodgings they share. 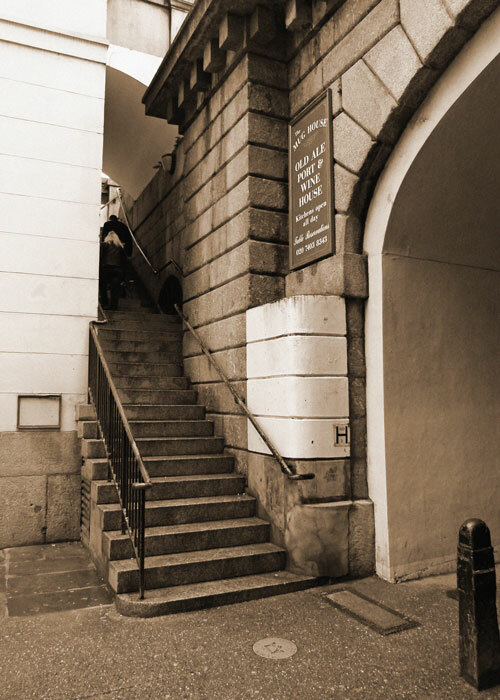 The steps referred to are real and still there on the west side of London Bridge, together with an arch supporting the southern end of it – surviving remains of the London Bridge designed by a Scot, John Rennie, and built by his son, Sir John Rennie, in 1831. I don’t know how many London Bridges there have been, but Rennie’s replaced one that had taken the traffic for about 600 years. The 19th century version was itself sold in 1968 for $2.4 million to American oilman Robert P McCulloch and was reconstructed at Lake Havasu, Arizona, USA. The current bridge opened in 1973. A plaque, last time I was there stolen or otherwise missing in action, marked the surviving fragments of the London Bridge that Dickens knew so well. It went on to inaccurately say that the steps were the scene of Nancy’s murder in Oliver Twist. Not true – though that is indeed where Sikes, played by Oliver Reed, brutally bludgeons Nancy (played by Shani Wallis) to death in the 1968 musical Oliver! Actually, they probably did it in a studio, but you know what I mean. Whatever – it seems a little ungrateful of him after she sang ‘As Long As He Needs Me’ so nicely. 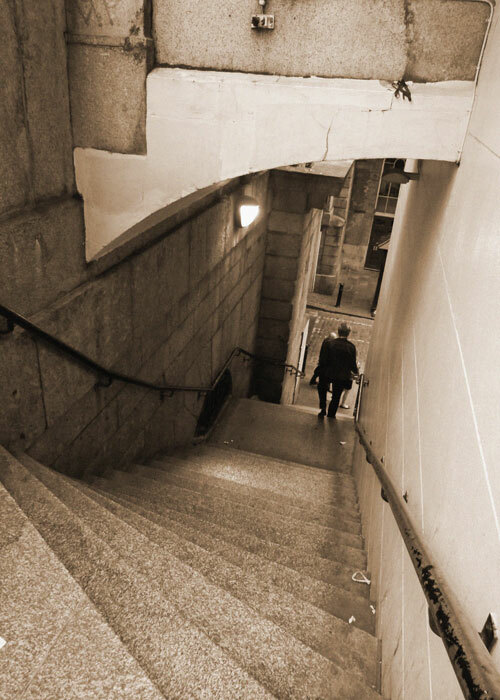 You may think it odd that a fairly unremarkable stairway has made it out of the pages of fiction (or the reels of a film) and into sightseeing guides. I do – it’s not as though London is short of quirky things to look at; but there you are. In any event, do not confuse Nancy’s Steps with the significantly less fragrant ones on the other side of the road, linking London Bridge station with Tooley Street via a small concrete shopping mall. Nancy’s steps can be the start of an interesting walk west along Bankside taking in, amongst other things, Southwark Cathedral (St Saviour’s), Borough Market, a replica of the Golden Hinde, the remains of Winchester Palace, the Clink Museum, the Globe Theatre, several pubs and the Millennium Bridge. Or head east under the arch (where Noah hid – or didn’t) for HMS Belfast and Tower Bridge. What a marvellous little gem amongst a whole jewel box of posts! It’s great how you manage to find information about things that many of us see and think ‘that’s interesting…’ and then pass by. I’ve even found myself reading posts on things and periods of history that I would normally say don’t interest me. Thanks, Richard. Given your own knowledge and writing, that’s very flattering indeed. A nice relic of Rennie’s bridge, but the “Nancy connection” is just something made up by tour guides as Dickens did not set the meeting there. To quote Dickens as you do – the steps that Nancy was on “form a landing-stairs from the river”. That is to say they go from the bridge down towards the river and could be used to board and alight from boats. The steps can be seen on the old OS map of the area http://maps.nls.uk/view/101201625 leading up from the river, complete with that wider lower flight that provided the place for Noah to hide . He was able to get round the corner on those lower stairs because, as Dickens notes, the tide was out. The landing-stairs were removed when the new wider bridge was built. The narrow steps that remain that lead in the opposite direction from the bridge to Montague Close can also be seen on the old map. The really amusing thing, of course, is that it’s a fiction anyway. Indeed so – but there are people who enjoy seeking out places that both exist in real life and which are also mentioned in fiction, and in this case Dickens used a real location described accurately but which has subsequently been demolished. So for those people who enjoy going to such locations, it would be a wasted journey if they only went there for that purpose (but an excellent journey if they went to enjoy the area in general). The steps in the 1968 film are, as you suspect, in a studio – indeed the whole film seems to have been shot on various sound stages and the backlot at Shepperton with the entire studio being used for the film at the time. I missed these, but I want to catch them next time. Oliver Twist was the first Dickens novel I read, while our high school was rehearsing the musical version. Not worth a special trip for the stairs, Joy, but a walk along that part of the Thames is very rewarding. Super post, Mike, I shall be sure to take a look next time I have to visit the Anchor Bankside! I may need to go back and reread my Dickens. Turning a literary staircase into a tourist spot is no weirder than having to renumber a bank on Baker Street and convert it to a museum about Conan Doyle, just because so many visitors wanted to see Sherlock Holmes’s house at 221b. (And the relatively newly installed platform 9 and three quarters at Kings Cross!) I rather like the idea of visiting Nancy’s steps. I bet we walked right past that and didn’t realize its significance. I wonder how many of your posts Mr. C. can get read before leaving next month. I like the shape of the steps. Thank you for this very interesting post Mike. Always so fun to learn new things thanks to you! I saw these on a Dickens walking tour of London with a group of students a few years back. You made a plain little corner so much more interesting with the quotes and commentary. I enjoy your blog so much! I’m really glad, and flattered; thank you!